"Kitchen Nightmares." I wonder if that crossed chef Brian Redzikowski's mind on his first day on the job at Bond St. About a year ago, Virbila of LA Times gave this New York sushi transplant a crushing zero-star review. Moving to turn things around, the owner recruited chef Brian Redzikowski to revamp the restaurant. Redzikowski is a young chef with an impressive pedigree - a graduate of the Culinary Institute of America, during which training he externed at Le Cirque and had monthly gigs at Alain Ducasse. He then worked at Nobu in Aspen where he first really learned the ins and outs of Japanese cuisine and sushi, but perhaps the most major influence on his cuisine was his two years as sous chef at Joel Robuchon in Vegas. Starting from scratch with an all new staff and new menu (for the most part - Bond St is a chain so some things they can't touch) isn't enough to erase the damages of the past, so in an attempt to get word around and people to try the new Bond St, Chef Brian Redzikowski extended an invitation to some foodbloggers to come check out his show. These days foodbloggers aren't strangers to press invites and media events, but this email came from the chef personally, from his personal email address. A nice touch and if nothing else made me very flattered. Plus the photos from his website certainly got my appetite going. I also figured out how to get amazing photos without buying and carrying a dSLR :P When I need a +1 for these events, I'll just bring along someone who owns one! The beautiful photos you see in this post are all the works of Mattatouille. I wanted to try their cocktail, but the only one that looked interesting was the one made with gin & basil. 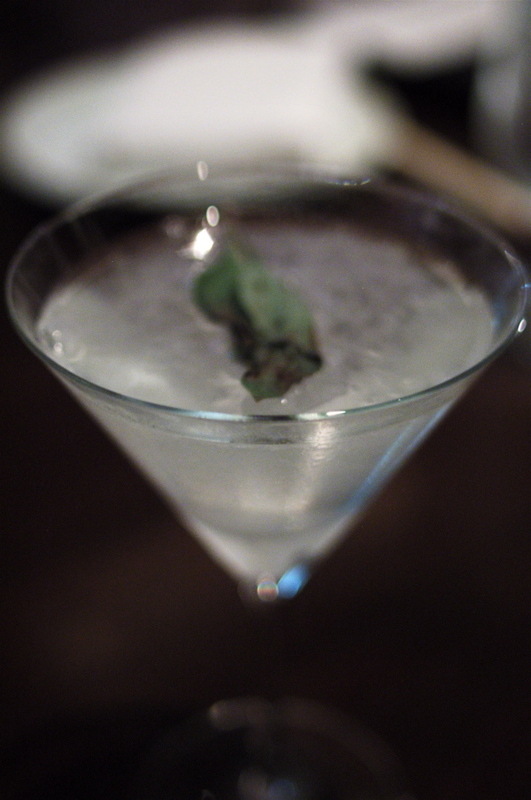 The cocktail was nice and light - tastes like a lychee martini but spiced up a bit by the basil. Not a bad drink, though the restaurant could definitely benefit from a more interesting and stronger cocktail program. Given the innovative molecular gastronomy going on in the kitchen side, a molecular mixology program would be a nice match. The wine list isn't extensive but satisfactory, with the cheapest bottle running $40 and a few by-the-glass options. BondSt is a sushi restaurant, after all, so our first few dishes were interesting takes of sushi, sashimi, and the likes. 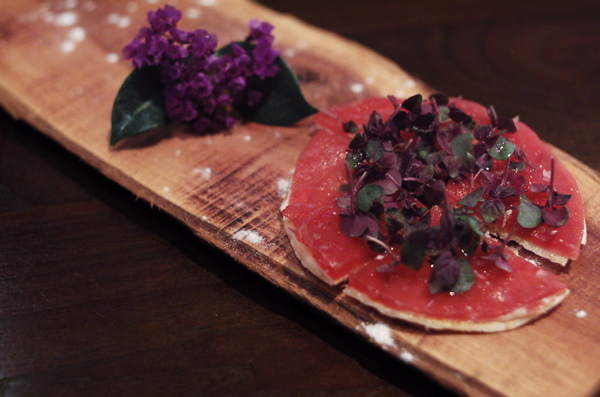 We started with the Tuna Tarts with micro shiso and white truffle oil. Next is his take on the "sashimi" platter. 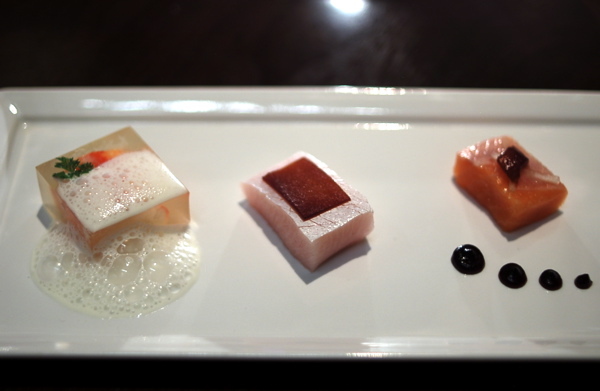 From left: King Crab encased in vinaigrette gelee topped with bacon foam, Hamachi with soy film strip, Salmon Belly with sous vide watermelon, watermelon rind, and soy dots. The king crab was fresh and the gelee encasing made this a fun bite. The hamachi was very fresh and quite fatty, on par with the fish you'd find at top sushi restaurants in LA, and the soy strip is again a fun molecular gastronomy play. The salmon belly is again fresh and deliciously fatty nicely accented by the sweet watermelon. 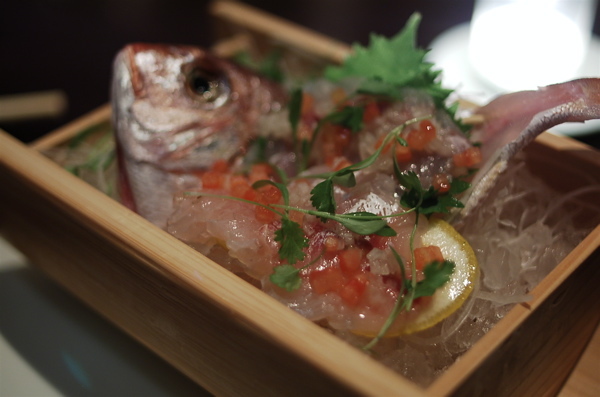 Baby Tai with yuzu, diced tomatoes, shiso leaf. A gorgeous presentation, for one. The fish is also so fresh and the flavors are elevated by the simple pairing with tomatoes and what tasted like pickled shallots. A lovely dish. 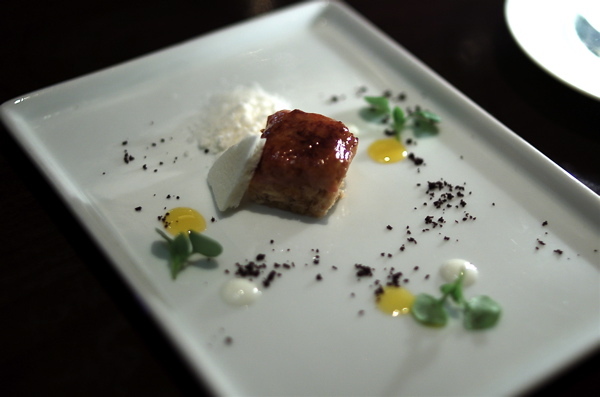 Bruleed Foie Gras over rice crispy, yogurt, yogurt chips, yogurt powder, lemon pepper. I think a diner would have to try this dish twice to get eating it right. Eating it in one bite gives you the crunchy rice crispy with a burst of foie gras at the end. But perhaps you want to work your way down and savor the foie first? You decide. This was the first time I've had foie gras paired with yogurt but it works quite well. This dish is quite sweet though, so sweet could be dessert. 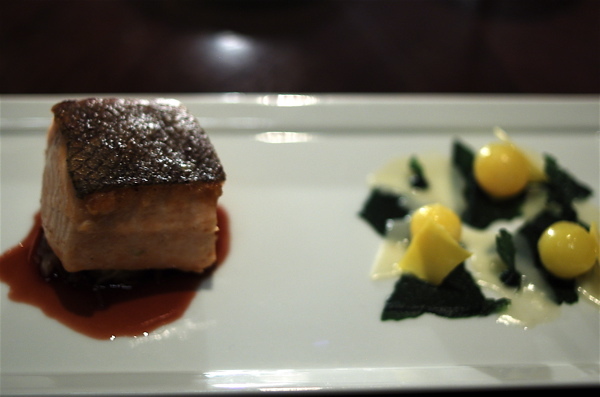 Coho Salmon, cabernet sauce, melted parsley, quail egg yolks. Nicely cooked salmon, moist and tender. I liked the melted parsley in this and the quail egg yolks, although overall it could use a little something to cut the richness. 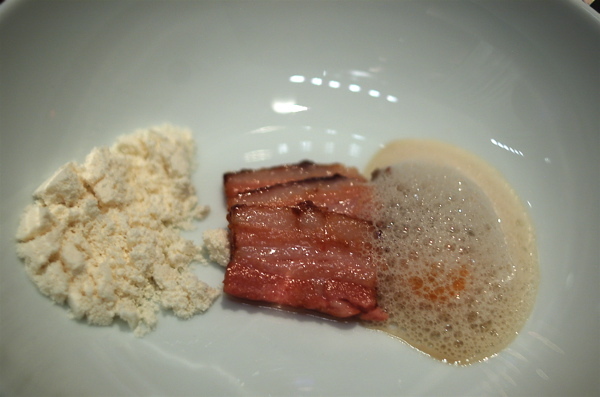 Sous vide Pork Belly, olive oil powder, artichoke foam. The pork belly is very tender and flavorful. Mattatouille said it reminded him of asian braised pork belly. 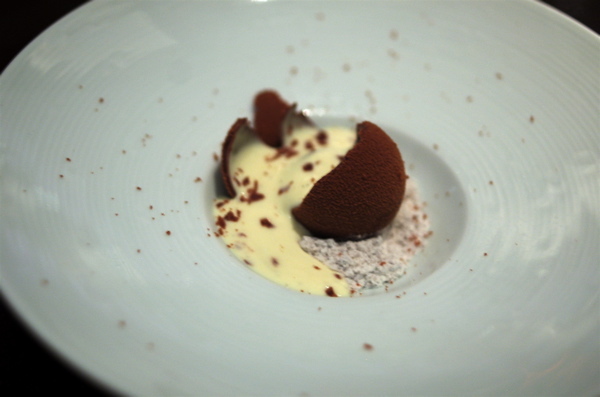 Here the powder has a richness that foam does not and adds a nice texture and more 'weight' to the dish. Next up is the highly anticipated Japanese bouillabaise. After reading the other reviews about this place, I made sure to tell the chef beforehand but I definitely wanted to try this dish. Our servers brought out this bowl of wonders and poured in the bouillabaise tableside. 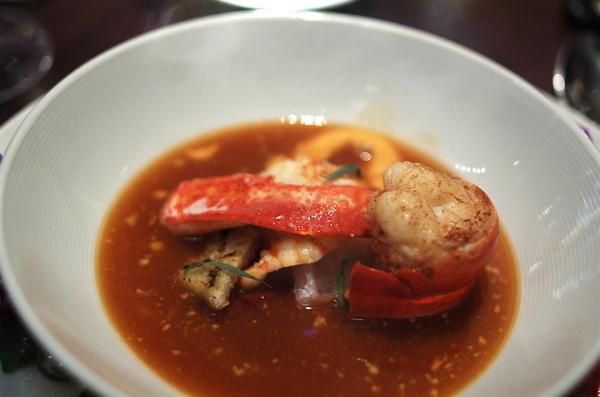 Japanese Bouillabaise: Lobster, shrimp, squid, uni rouille, texan butter toast. This is definitely a dish worthy to be a favorite. If the chef is trying to decide on a signature dish, this one would have my vote. A little spicy but that definitely added a nice kick. The shrimp is reminiscent of amaebi and here it is amazingly good and succulent. 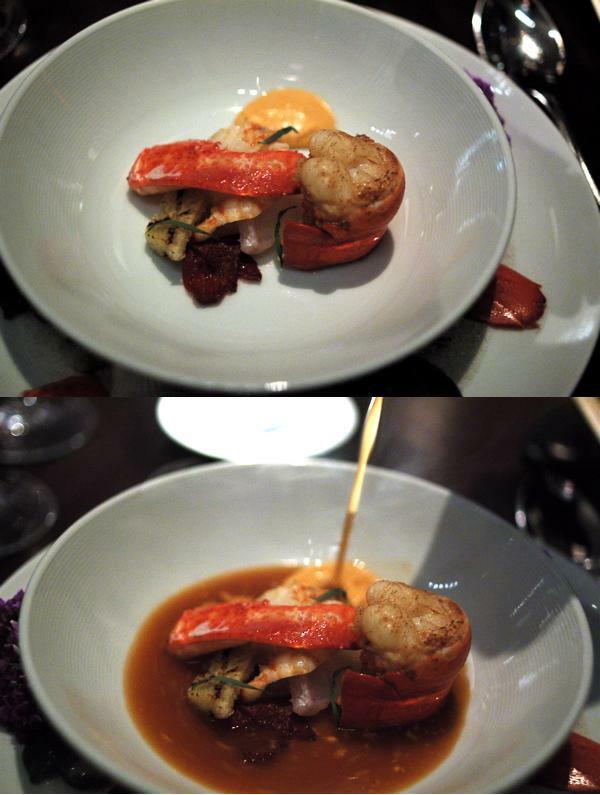 Not to mention the creaminess of the uni rouille and, saving the best for last, the plump lobster. One of the top dishes I've had as of late. After one off experience with a sous vide red meat somewhere else, I was wary of this dish, but it turned out to be fantastic. 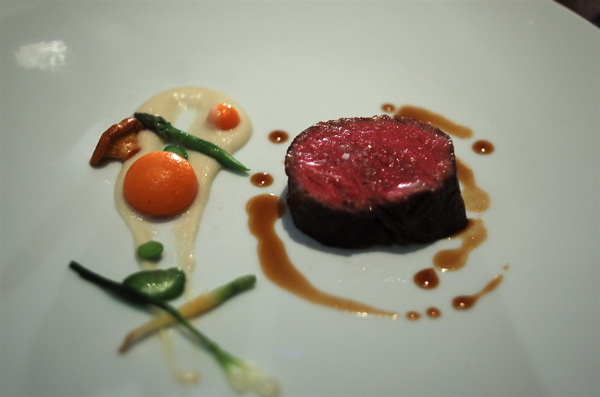 Cooking wagyu, known for its fattiness, sous vide, made it very tender. Unlike the amazingly fatty 100% wagyu at Cut that made me think "butter", this one gave me satisfaction of "steak". We had fun with the carrot sphere too, as when you bite into it, a burst of carrot puree was released. The thickness of the puree made this 'sphere' stand out from others we've had before. Next they served us a series of desserts to share. The first set was a pair of caramel desserts. 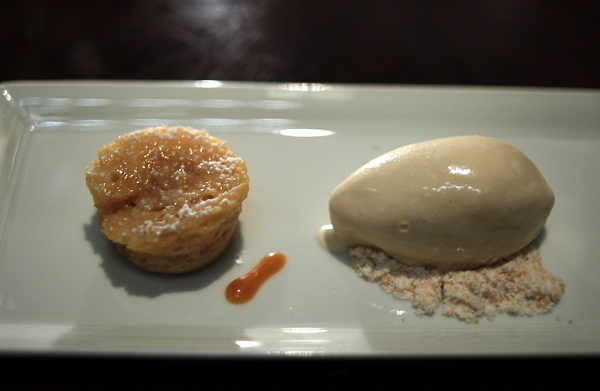 Caramel Three Ways: Sponge cake, Ice Cream, Powder. The sponge cake is surprisingly light (I expected caramel to be much denser and thicker) and so made it into a nice start to our dessert session. 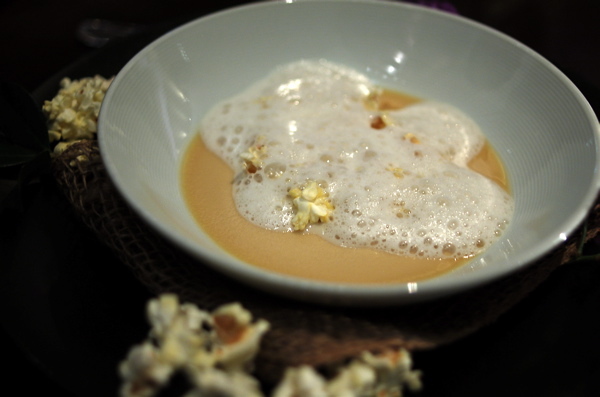 This was a nice texture play with the smooth and creamy caramel milk with the crunchy popcorn. I had again anticipated a thick and sticky caramel sauce, but this was more like a rich caramel-flavored milk (actually, it's like eating Kashi cereal with sweetened milk). The sweet and salty combination is also a fun play off of caramel fleur de sel. Mochi Donuts with candied rhubarbs, yogurt, coconut ice cream. Crunchy and chewy, all in one pop. That's fried mochi donut for you. Small and delicious, this is something you can end up eating dozens of while chatting away. Thankfully there were only three pieces. You know what's waiting inside, yes, you do. So let's crack it open, shall we? 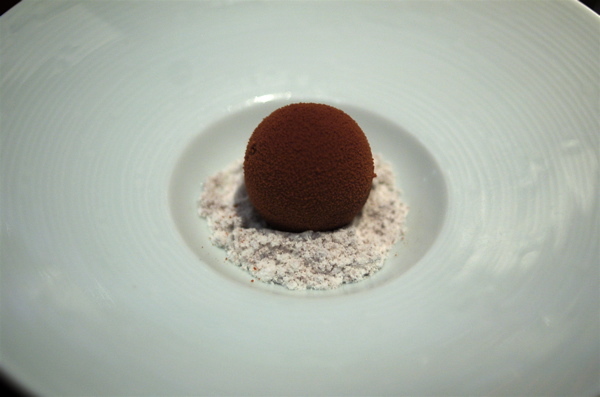 Creamy caramel milk oozed out of the chocolate ball, blending with the nutella powder. Redzikowski finished strong with the desserts, nothing was overwhelmingly rich or sweet, just a nice and balanced finish. Redzikowski's dishes are innovative and well-executed. 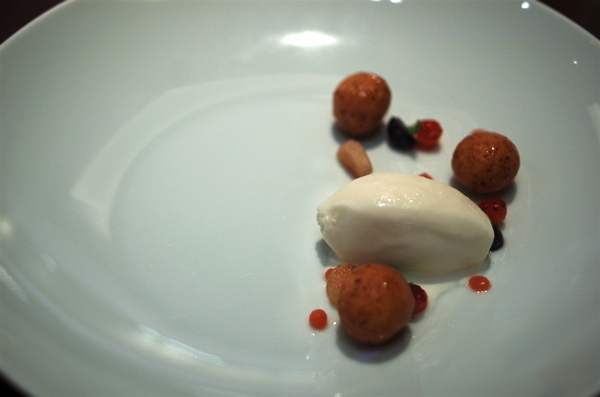 His use of molecular gastronomy is not only fun but purposeful. BondSt is definitely well on its way food-wise. The extensive menu at the moment is hard to navigate but they are working on a tasting menu (which is currently available by request). The hard part now is to get people into the restaurant to give it another try since last year's fiasco, and I think you guys should get in there now before word gets out. The guy's trying really hard to be .. LA's L20? imitation is the greatest flattery. i enjoyed this meal, though i wonder if he could replicate it in this quality for 100 covers a night. i hope he can. Indeed. L2O was the first thing that popped into my mind when I saw that caramel ball. Redzikowski's version, however, does have a liquid center versus Gras' mousse filling. we'll volunteer to take your photos any time!! :) Great to meet you today and great blog! Comparing apples to apples, I gotta say Bond St cranks out a better molecular dining experience. I'm glad to hear you had a good experience. for you fooddiggers, know that you'll be on the rooftop for your meal. 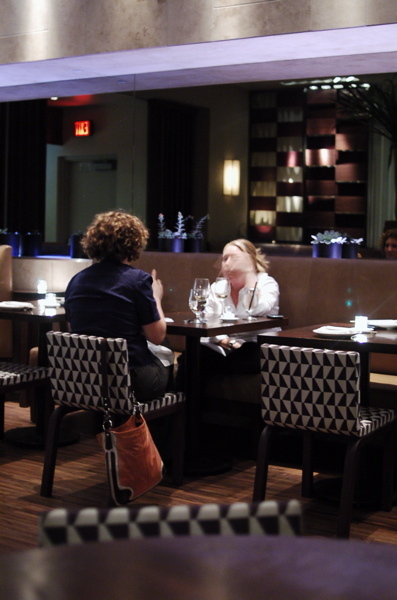 Prepare for very low lighting (main dining room was also very dim), though we warned the chef that you'll want brighter lights. we'll see what they do. Man, the chef sent out that invite after I left LA. I'm still getting all this PR stuff from LA restaurants. I need to transplant myself to get some free meals in NY. I noticed many of his dishes seem to come in cubes. I don't know how I feel about that. Seems like a lot of wasted scraps. I'm glad you enjoyed the experience. Chef Redzikowki is definitely changing BondSt for the better. The lighting issue has hopefully been resolved, so no worries. Bali, Suckling Pig, Paradise Island.